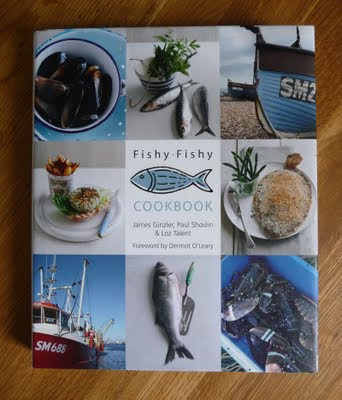 Incredibly I've yet to make it down to the Fishy Fishy restaurant in Brighton despite having heard many a good thing about it. The style and laid-back attitude seems to suit us Brightonians down to the ground and Dermot O'Leary, despite his involvement, hasn't made it feel like some superficial celebrity endorsed enterprise (thank goodness, we have enough of those). 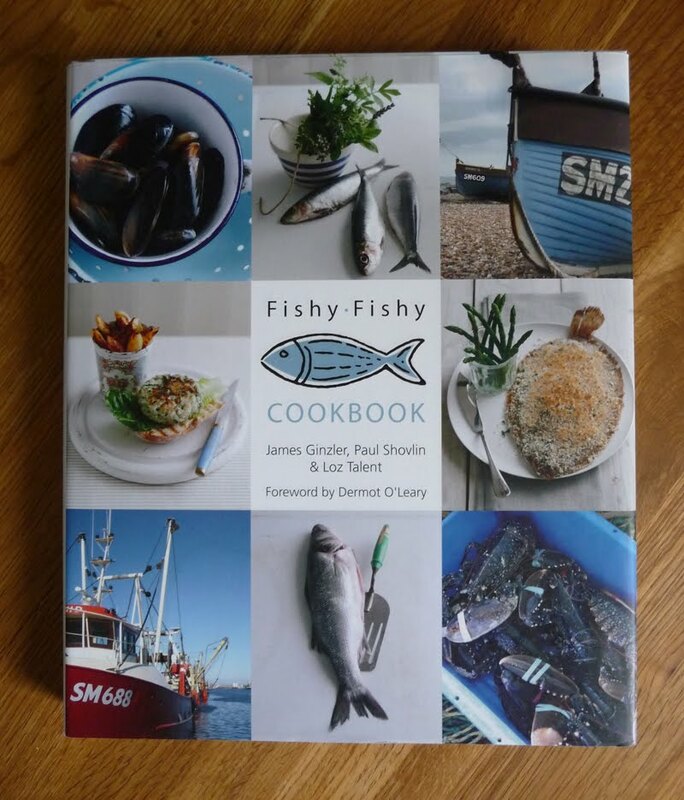 Despite only being open a couple of years, it hasn't taken them long to produce a cookbook and good timing too as fish seems to be the hot culinary topic at the moment. 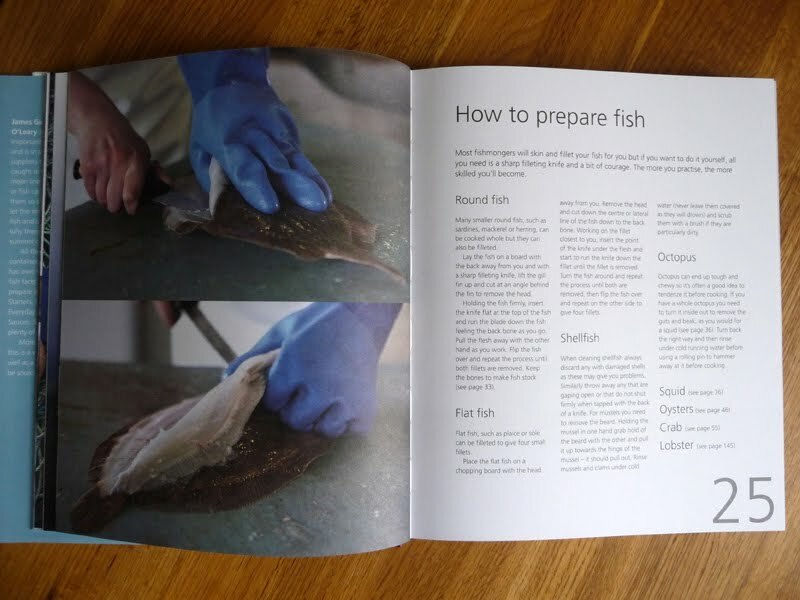 You would expect to some degree some info on sustainable and local sourcing as well as the types of fishing methods and the "do I don't I cod?" issue, all of which are covered in the opening chapters, along with handy sections on fish preparation and selection. And it's so good to see that there is much great fish to be had near my hometown. The beauty of this book is its simplicity, both in design and content. 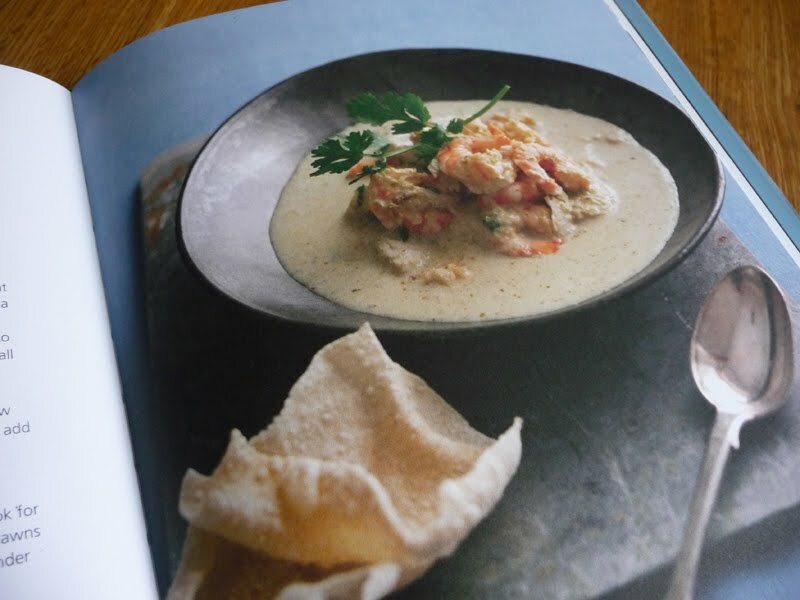 Fish requires very little to make a great meal and most recipes are more of an explanation of the fish variety in terms of taste, season and tips on buying like choosing "crippled" lobsters that have lost claws as a cost saving measure. 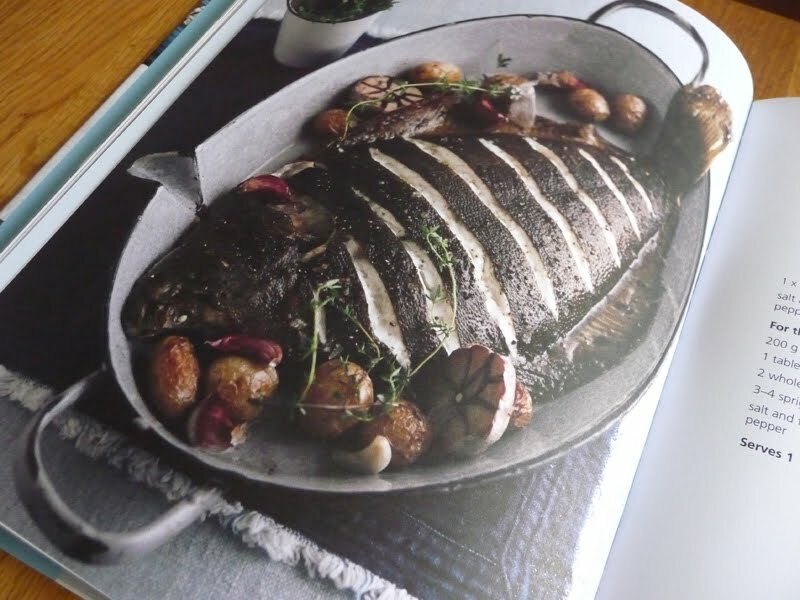 The book also highlights the versatility of fish; kept as fillets with simple accompaniments like salsas or sauces, or as pates, stews, burgers, pies or even multiple ways of serving oysters or squid. 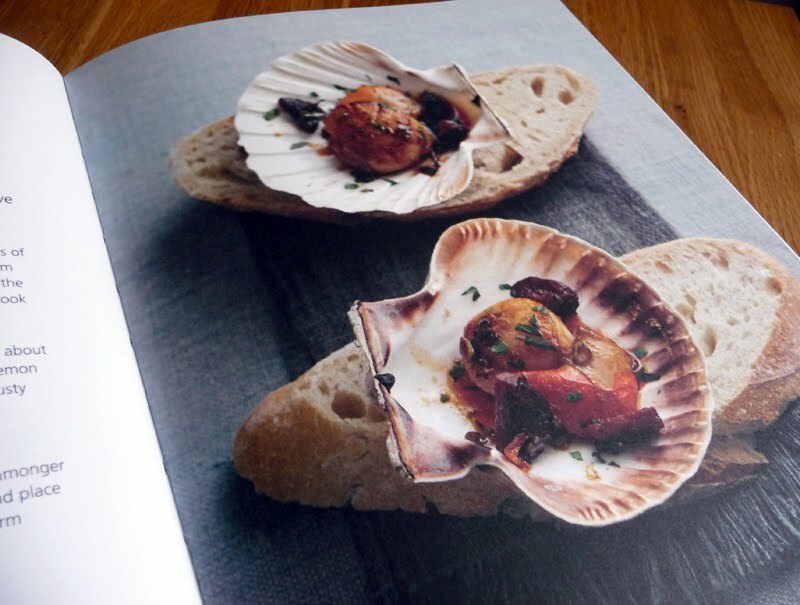 Interestingly there are also a few recipes in here for non fish eaters like Goat's Cheese and Red Onion Tartlets and a short section on desserts. Unfortunately, I seemed to have picked a bit of an erroneous recipe to start with. I adore Kedgeree, they used to serve it at 4am when I used to go to fancy dances with Mr GF in his Officer's Mess. After the buckets of booze we used to consume it was always a welcome smell and sight! 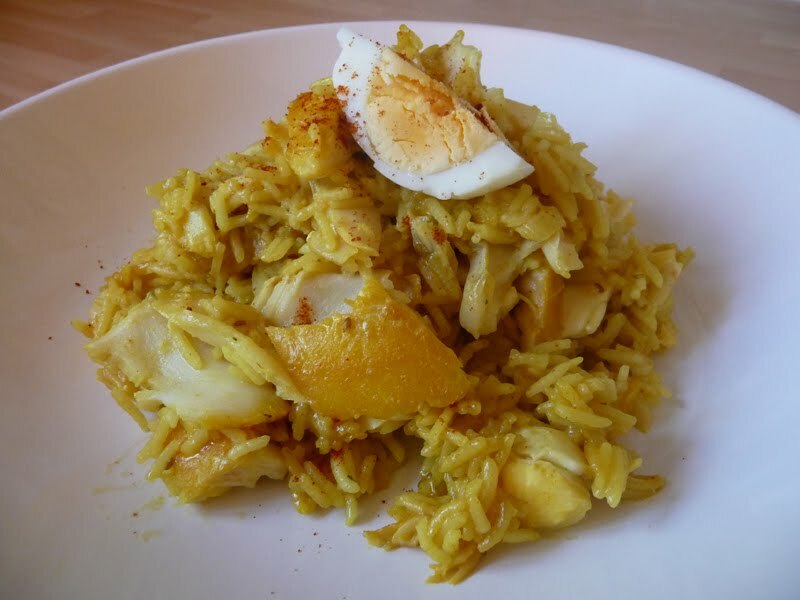 The recipe here stated it was for 2 people but 600g of smoked haddock smelt a little fishy to me. I mean, you'd HAVE to be a trooper to consume that amount! Turns out the recipe should have been for 4-6 people so I halved it anyway yet oddly still needed the original stated 300ml of fish stock plus more water for half the amount of rice. Hmmm. Still a very tasty result and one I'll try again (with my hand scrawled annotations in the book!). That aside, I still preferred the depth of flavours from my tried and tested recipe better due to having far more spices but for a quick and easy mid-week recipe with limited ingredients, the Fishy Fishy curry is ideal. 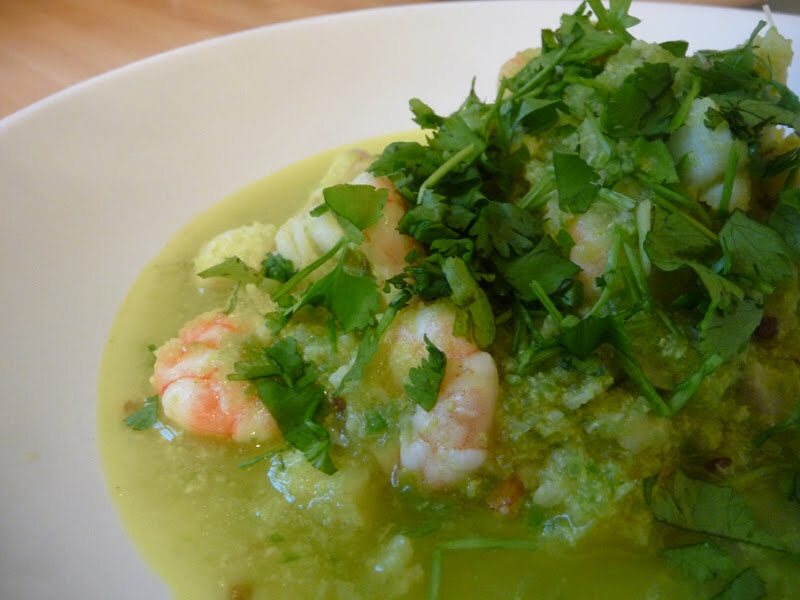 This is an affordable, well presented and designed cookbook. Looking at the recipes I think where this book will shine is in cooking those using simple fillet or whole fish. I still have much to learn and hopefully this will make me as comfortable with cooking fish as I am with meats. The Skate Wing with Brown Butter and Scallops with Chorizo are next on my list to try and I'll be sure to dip into this for mid-week solutions. And I really must get down to the restaurant! I received this copy for review.